The nototheniid Pleuragramma antarctica, commonly known as the Antarctic silverfish, dominates the pelagic fish biomass in most regions of coastal Antarctica. 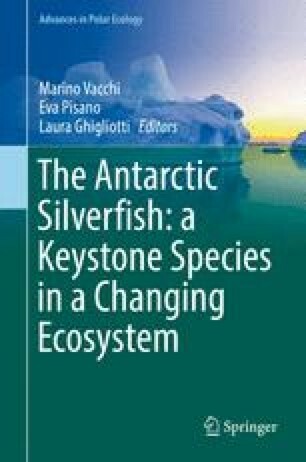 In this chapter, we provide shipboard oxygen consumption and nitrogen excretion rates obtained from P. antarctica collected along the Western Antarctic Peninsula and, combining those data with results from previous studies, develop an age-dependent energy budget for the species. Routine oxygen consumption of P. antarctica fell in the midrange of values for notothenioids, with a mean of 0.057 ± 0.012 ml O2 g−1 h−1 (χ ± 95% CI). P. antarctica showed a mean ammonia-nitrogen excretion rate of 0.194 ± 0.042 μmol NH4-N g−1 h−1 (χ ± 95% CI). Based on current data, ingestion rates estimated in previous studies were sufficient to cover the metabolic requirements over the year classes 0–10. Metabolism stood out as the highest energy cost to the fish over the age intervals considered, initially commanding 89%, gradually declining to 67% of the annual energy costs as the fish aged from 0 to 10 years. Overall, the budget presented in the chapter shows good agreement between ingested and combusted energy, and supports the contention of a low-energy lifestyle for P. antarctica, but it also resembles that of other pelagic species in the high percentage of assimilated energy devoted to metabolism. It differs from more temperate coastal pelagic fishes in its large investment in reproduction and its pattern of slow steady growth throughout a relatively long lifespan.